Libya announced yesterday that they would erect a statue of Saddam Hussein on the gallows. Flags were flown at half-mast. TRIPOLI, Libya – Libya will raise a statue of Saddam Hussein alongside that of a national hero hanged in 1931 for leading the Libyan resistance against Italian occupation, the government said Thursday. Libya declared three days of mourning after Saddam’s death and cancelled public celebrations around the Eid religious holiday. Flags on government buildings flew at half-mast. The article may be in Arabic but you get the gist of it anyway. 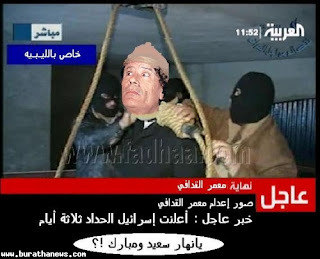 Meanwhile… In Egypt another tyrant proclaims that Saddam’s execution makes him a martyr.